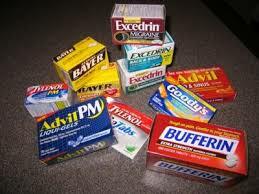 There’s aspirin, ibuprofen, acetaminophen, and naproxen – each sold under several brand names. Here’s what you need to know to choose the right one for you. When you’re looking for an over-the-counter pain reliever, a walk through your local pharmacy is bound to give you headache. With so many choices and brands it can get confusing, so here are the basics. Aspirin is a good general analgesic, meaning it relieves pain. It’s great for anything that hurts: headaches, muscle aches, joint pains, and fevers. People with stomach or colon bleeding should never take aspirin. Also, it should never be given to children. “There’s a rare incidence of something called Ray’s Syndrome, which is a very serious disease that can be caused by aspirin in kids,” says Bertie M. Bregman, MD, of Westside Family Medicine in New York City. Over-the-counter brands include Bayer and Ecotrin, or you can just buy a generic bottle of aspirin, which is often less expensive. “I would say that there’s no discernible advantage to brand-name over generic aspirin, so you might as well just look to see what the dosage is and if it’s the same. Go for whichever is cheaper,” Dr. Bregman says. Acetaminophen is also an analgesic, like aspirin, so it’s commonly used for headaches and pain. But since this is not an anti-inflammatory substance, it won’t do much for muscles or sprains. Bregman says anyone with liver problems should stay away from acetaminophen and be careful when giving it to babies. Ibuprofen is primarily used as an analgesic for headaches, and joint and muscle pain. It lowers fever and works as well as an anti-inflammatory. It’s also safe for children. Anyone with kidney problems should stay away from ibuprofen. This drug helps with headaches, and joint and muscle pain. It’s especially effective as an anti-inflammatory agent for arthritis, sprains, sunburns, menstrual cramps, and other inflammation-based pain. “The main reason to choose naproxen over ibuprofen or aspirin is that it’s longer lasting, so you don’t have to take it as frequently. It lasts longer in your system,” says Bregman. Aspirin, ibuprofen, and naproxen are all part of the same class of medications, known as NSAIDs, so they should never be combined. It is possible to take acetaminophen with these three, without worrying about side effects. If you’re ever unsure of what to pick, the pharmacist is always a good resource. Remember if over-the-counter medicines aren’t working, be sure to speak to your doctor or health care provider.